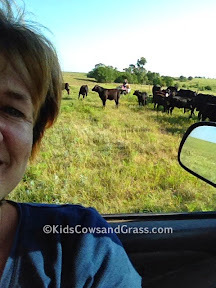 Kids, Cows and Grass: Do you dread looking in a mirror? Do you dread looking in a mirror? Do you dread looking in a mirror? I do. When I am forced to check my appearance in a mirror or use my reflection to put on makeup, I avoid looking directly at myself. I look only at what I want to see or am comfortable with. I think that is a common habit of women. I would rather not see the wrinkles around my eyes, my too ruddy complexion, my chubby cheeks or the zit on my chin. And I never look myself directly in my too squinty eyes. And that's just above the neck! I see the imperfections and ignore any positive attributes. I assume that everyone sees the negatives first as well. I had a very powerful experience recently that reminded me of the beauty of my imperfections and helped me disregard the need for society's vision of beauty. At the BlogHer conference I looked in the mirror--in the trade show, in front of tons of women who were in line waiting for their turn at the mirror. And the mirror spoke back to me! It told me I had beautiful teeth and they shine when I smiled. The mirror reminded me of my hands that work hard on the ranch to take care of my family and my animals--strong and tender at the same time. And the mirror spoke to me of my heart that loves to give to the people around me. Wow! That was some mirror!! It made me cry! It was hard to listen to, but it was a beautiful experience! 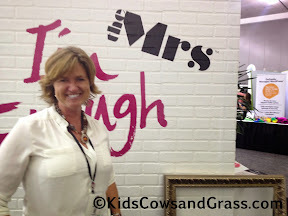 The mirror was in a trade show booth sponsored by The Mrs. Band and the focus was "I'm Enough!" Check out this mirror! You see, women set high expectations for themselves. Expectations that are often artificial. I guess society originally set those expectations but we have perpetuated them. We need to remember that we are enough--good enough, beautiful enough, strong enough, and worthy enough. During the conference the Mrs. Band released the single "I'm Enough" and I downloaded it immediately! I mean immediately--while the band was still on stage performing it! Go to their website, like them on their Facebook page, download their song! It has a beautiful message for all women-- you are enough and don't have to measure up to anyone's expectations. I don't know about you, but when I'm feeling bummed or worn down I have a playlist that I listen to on my phone. I just added "I'm Enough" to this playlist. Sometimes I dream that there were two of me. One is real and one a fantasy. She's a perfect ballerina dancing on a cloud. I'm enough, I'm enough, I'm enough, I'm enough. Don't tear apart this work of art. I'm enough, I'm enough, I'm enough. I'll rise above. I know I'm enough. Talking to the boss about to speak my mind. I won't wait forever and I won't be last. Now I'm breaking through the ceiling made of glass. No more holding on to someone I don't need.